I came upon this Timber Rattlesnake while walking a road near the Ouachita National Forest here in Arkansas back in April of 2015. This was my first time seeing one of these. As soon as it saw me it coiled in the middle of the road and I was able to get several photos. This one wasn't very large. I would guess it would be approximately 3 feet long. Adults usually grow to a total length of 36 to 60 inches. I walk several of the roads in the Ouachita National Forest looking for snakes that like to cross these roads. 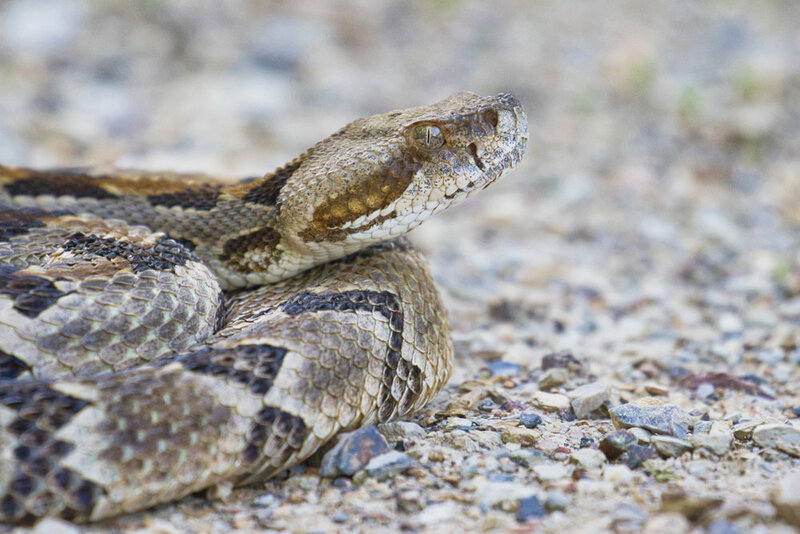 I was hoping to find one of these Timber Rattlesnakes and I got lucky when I came across this one. I was also lucky that this one decided to coil instead of crawling into the brush. I was sitting in the road, hand holding my Canon EOS 7D Mark II with the Canon EF 100-400mm f/4.5-5.6L IS II lens. I was shooting in aperture priority mode (AV) with a shutter speed of 1/500 of a second at f5.6 and the ISO at 1250. White Balance was set on auto. I was using single point, continuous autofocus with evaluative metering. The images displayed on this site may be used for any non-commercial purpose after obtaining my permission. If you have an interest in licensing any of my photos for commercial purposes or would like to discuss custom prints and/or services, please Contact Me.